Bryan, Malcolm, Keith, Isabel, Linda and I met last night to discuss the allocation of funds. We agreed that £4000 would be distributed immediately to 26 local organisations (£1600 for young people, £1000 for the elderly, rest to local interest groups). We also discussed the various ideas for a permanent reminder in the village including a proposal from Rob Bucket to restore the Borough Cross and it was this latter idea that we unanimously decided to take forward. The first steps are to talk to the Parish Council, English Heritage and get some quotes. The Cross already has inscriptions from Victoria’s Diamond Jubilee and the Queen’s Coronation so it seemed appropriate, and we hope you agree, that restoration would be a fitting legacy for our Jubilee funds. 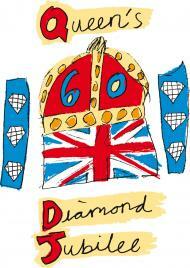 The Downton Diamond Jubilee Festivities made an astonishing profit of nearly £9,000. This was due to greater than anticipated ticket sales, generous sponsorship and lower than expected costs. at the post event meeting it was decided to allocate £500 to 'prime the pump' for any future celebration and the rest to be given back to the village. this will be done in two ways. 1 - Firstly, the bulk will be distributed amongst local charities, clubs, societies and other non profit making village organisations. If you or your group would like to apply for some funding please write a letter or email by the end of Septembr 2012 (contact detials below) stating what you need the money for and the amount you are hoping to receive. Those who have already bid, do not need to reapply, as all bids received will be considered after the closing date (30/09/12) A committee will meet at the beginning of October to allocate the funds. We hope to assist as many local groups as possible. We would like to have your thoughts on the above ideas and we also anticipate that you will have further suggestions, which we would welcome. For all comments and new ideas, please get in touch by the end of September. We will be working with the Parish Council on this Jubilee project. St Laurence Church have great pleasure in wishing success and enjoyment for all involved in the Downton Queen's Diamond Jubilee Celebrations in June 2012. A fantastic way to honour the Supreme Govenor of the Church of England. The Downton Queen's Jubilee Committee and team have estimated that it will cost at least £20,000 to put on this day of celebration. The money is being raised through fundraising events (over £6,500 raised to date), sponsorship, advertisement space in the concert programme, concert ticket & programme sales and bar profits. The fund was kick started by £600 left in the Golden Jubilee Account when a similar day of festivities was held 10 years ago. An award of £1204 has been received from the Local Area Board (Wiltshire Council). Any profits made from the day will be distributed amongst local charities. Our final fundraising event is the Duck Race at Cuckoo Fair. Please come and buy a duck and then watch it ‘race’ down the Avon. Over 60 vehicles, including steam engines and vintage & military vehicles, will process down through the village. There will be music and bands as well as floats decorated by local organisations. The procession will start at 1.30pm from the old Rugby field next to the Roman Catholic Church in Barford Lane and disperse at the traffic lights. We anticipate that the Borough/ High Street will be officially closed from 1.30pm-4.30pm although it is likely that the Borough east of the Iron Bridge and the High St will be open once the carnival has passed through. If you wish to take part or have a suitable lorry/ tractor trailer that others can use please contact Malcolm Dean (01725 511221). 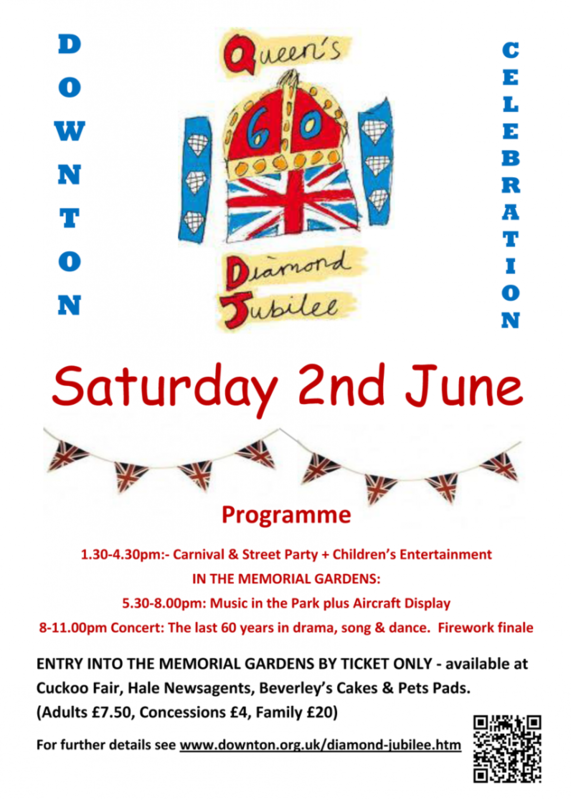 The street party will be taking place as the carnival processes down through the village and is for everyone but, if you are 65 or over and live within the Parish of Downton, you will get a personal invitation and food will be provided. Tables and chairs will be set up on the Maypole Green in the Borough. If you have yet to reach this age please bring your own picnic and chairs. There will also be entertainment for children including a bouncy castle, circus workshop and face painting. Contact Sally Brown on 512902 if you have any queries. Contact Jeremy Parsons on 512963 for further information. This will finish with a display by a Harvard airplane (weather permitting) courtesy of Peter Bercheret. The day’s climax is the Grand Jubilee concert in the Memorial Gardens, produced by Jane Seden. This will cover the last 60 years in drama, song and dance. Over 150 local dancers, singers and actors will be taking part and it promises to be a highly entertaining performance. Jane Seden (510122) would welcome hearing from anyone who can help backstage. A licensed bar and refreshments will be available to purchase.